What does ever after mean? ... and they lived happily ever after. Ever after is a phrase that means "from this on." It often appears in the phrase happily ever after, a conventional ending for fairy tales associated with lasting love. She asked them, ‘Do you want to know the secret to ever after?’ And the girls looked at them with wide eyes and said, 'Yes,’ and she said, ‘Money and power. But as they attempt to live kinkily ever after — buying houses, debating surnames and contemplating children — a jealous stalker from the past, Jack Hyde... simply won’t leave them alone. Where does ever after come from? We can find the phrase ever afterward around 1300 and ever after in the early 1400s. They mean “for all time (ever) going forward from some point (after),” which English speakers would generally say or write as ever since today. Except in fairy tales, where ever after survives in the formula of happily ever after. This particular phrase is recorded by the early 1700s, but by the 1860s it had become commonly associated with fairy tale and children’s stories. It especially appears in they lived happily ever after—making sure all the princes married their princesses in their castles and enjoyed the rest of their days. By the 1880s, we can already find authors calling happily after ever out as BS. What, exactly, cemented this connection isn’t clear, as the historic sources of fairy tales don’t feature happily ever after. Nevertheless, the connection was sealed by the 20th century. Not only have countless stories closed with (happily) ever after, but the phrase itself has come to represent fairy tales and happy endings—and marriages, where happily ever after is the storybook ending we’re told to dream of. Finishing actual stories with living happily ever after became cliché by the 1990–2000s, but popular media, writing, and speech widely use ever after in titles in everything from collections of fairy tales to self-help books on retirement. 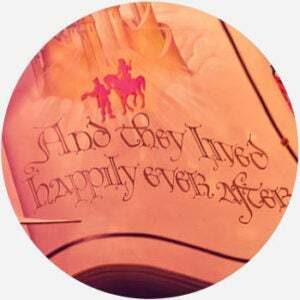 Disney even has a wedding blog called Ever After. And, remember that Drew Barrymore movie Ever After, a 1998 fantasy romance? Ever after has become so common that we can use it like a noun (e.g., we’re all searching for our happily ever after or he finally found his ever after). How … nauseating. If all this lovey-dovey ever after business may make you want to gag, many people have riffed on happily ever after for more real-like sentiments. crappily ever after is more like it. And many instances of ever after are dripping with skepticism (e.g., Go on thinking we all live in some magical fairyland where we all live happily ever after.